This week's featured Sunday Sludge artist is Swedish church-burners el Camino. Combining Sludge, Doom, and more than a pinch of Sabbath, these five Scandinavian stoners have been rocking pubs and festivals since 2008 (though the band's original incarnation formed in the winter of 02/03). 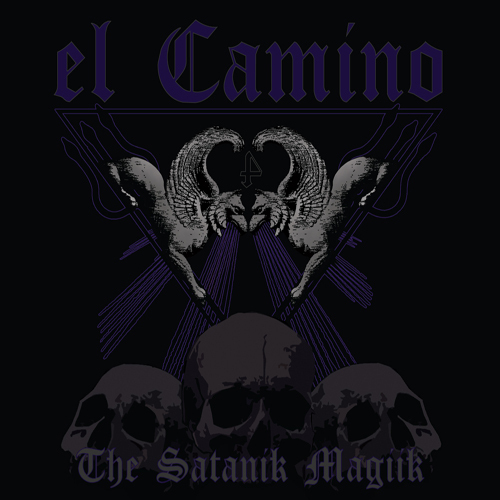 Their 2011 offering, The Satanik Magiik, consists of eight muddy, despondent tracks dedicated to what the band's bio refers to as "the nameless entity, lurking in the black shadow... ready to strike." We're treated to heavy doses of evil, via el Camino's incessant prompts to "welcome the beast... kill the light." Throughout The Satanik Magiik, the listener is greeted by slow, grinding guitar, thunderous drumwork, layered howls, and plenty of dark themes. "Prelude to the Horns" is a perfect introduction to what this album promises to deliver, as el Camino assures us "the beast is coming to your world." The wavering guitars ultimately give way to an uphill march, prepping a helpless village for impending destruction. There's a groove here, though it doesn't distract from the ominous message. The sludgy wah-wah transitions smoothly into the confidence of "Hail the Horns," where we finally hear DR (vocals) growling beside solid riffs, all hovering over a steady sludge rhythm. The track closes with grinding, puddle-slapping groove paired well with feedback fadeout. The disc's mid-section is its strength. On "Mountain Man," DR proclaims "it's not your choice; it never really was." The guitars are layered, the sludge is groovy, and a balance is well-struck between singing and snarling. "Rise of the Snakes" is lifted, exhausted, and soaring. Slipping on a hill, barefoot, is what this song sounds like. Satanik Magiik's lyrics are strongest here, as evidenced by lines like "This world shall be known as the one that failed." Bass licks around solid groove before the song breaks itself down and gently fades. While the band's sound is distinct, it also doesn't allow itself to be easily categorized. Balancing the rhythm section's spooky groove are hints of psychedelia, deep-sea guitar vortices, and even distant melody beyond all the mire. el Camino frequently forgo slinging birdlime to trample dry land for brief solo shreds, while the drums stay thick and oppressive. "Family Values" sounds like an unearthed Black Sabbath tune, while DR's whispers parallel Phil Anselmo's. The guitars are wonderfully repetitive and defiant, taking over as if to give the vocals time to catch a second wind. "Satanik Magiik" serves as a sludge jam, with MJ's deliberate drums complementing TP's bouncy bassline before throwing in samples of archaic Latin scripture. "Avra Kehdabra," the album's closer, makes me wish I'd never tossed my turntable. Evil backmasking dominates the track, while the aftertaste combines fuzz, Lon Chaney films, and vinyl that's been left in the back of your mom's car. el Camino's feculent sound is never overbearing, nor is their predilection for cleaning up (with appropriate brevity) once in a while. These Swedish corruptors have crafted a great album, blending styles to form their own basement-dwelling, pentagram-carving atmosphere. "el Camino" translates to "the road," or "the way." This band got lost with the devil a long time ago, and finding their way back is the last thing they want.